We’ve been pretty vocal about our disappointment with the current-gen Audi Q3. Being that it’s still based on the old MkVI Volkswagen Golf platform, it’s seriously dated, especially when compared to its newer rivals. So not only is it the oldest car in the class but it feels even older than that. 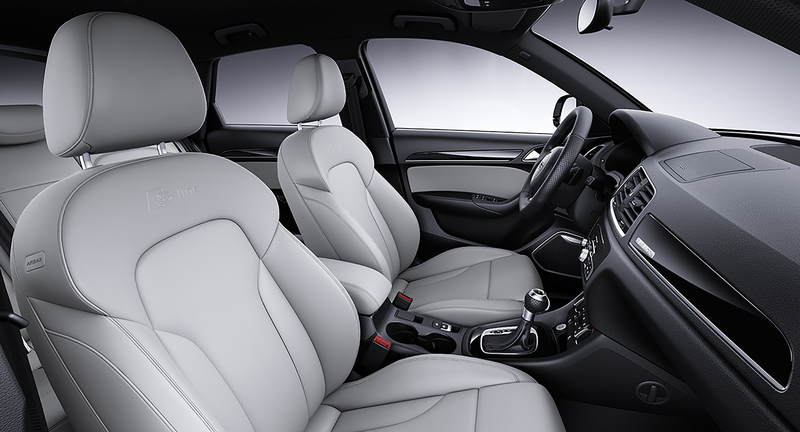 One of the biggest problems with the Q3 is its interior, which looks like it’s from a ten year old Volkswagen. Mostly because it is. However, the upcoming Audi Q3 successor has just been spied and its new interior looks to be a massive improvement. In these new spy photos (which we don’t own but can be seen here), the Audi Q3 gets an entirely new interior. The first thing you notice is the steering wheel, which looks plucked straight from an Audi A7. This is good, as bringing parts from the brand’s more expensive models to some of its more inexpensive models makes even cheaper cars feel more premium. That’s how you’re supposed to carry design throughout the brand. The next thing you notice is that there seems to be a very large infotainment screen mounted in the center of the dash, not sticking up out of it. This looks far more like the new Audi A8/A7 design, rather than on any other new Audi. What’s interesting is that underneath that screen are some physical controls. It seems that we can see one of the temperature dials for the dual-zone climate control. So the screen up top might be a touchscreen, like on the new A8, but it won’t get two of them like on that car. The screen looks very large, though, and we can see that the navigation screen is up, showing off rich graphics. We can also see that this new Audi Q3 has the same Virtual Cockpit as you’d find on the new A8, which is updated since the technology’s original debut. So it should have an even better system than what you’ll find on the current Audi Q5 or even Q7. Though, both of those cars will likely get the new system with their mid-cycle refresh. It’s also yet to be seen whether or not the Virtual Cockpit will be as-standard on the Q3 or an option. We’re assuming the latter but we could be wrong. Overall, this is a promising sign. The current Audi Q3 is a snooze-fest and this new cabin seems to be a good way to make it exciting. It should also be pretty inexpensive, so we’re looking forward to seeing what the new Q3 brings.